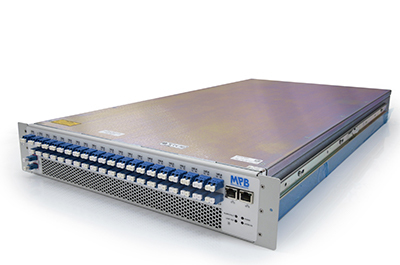 Building on its extensive EDFA experience developed from the Telecom world, MPB introduces its DCI Family of fiber optical amplifier with user experience specifically optimized towards Data Center operators. Advanced features such as Zero Touch Provisioning (ZTP) and remote monitoring are introduced to address the unique needs of the Data Center operators. DCI-SR/LR series has been optimized for operators with need to provide amplification coverage for the entire C-band and extended reach; while DCI-Eco series is optimized for budget friendly, versatile operation of the smaller operators. Both systems have been tested with industry leading 100G PAM4 transceiver manufacturer and also capable of working with other modulation format. A 1RU versatile line system designed to bridge a fiber link loss up to 18 dB and for up to 8 PAM4 DWDM channels with options that suite unique needs. The DCI-SR unit is composed of a multiplexer / demultiplexer, optical amplifiers, dispersion compensators and an optical supervisory channel. In addition to the similar components used in DCI-SR, DCI-LR unit has the addition of a Raman counter pump which provide additional gain over the entire C-band.